Paparazzi photos have satisfied rumors that Miley Cyrus has a tattoo on her ankle…one that matches boyfriend Liam Hemsworth’s! The matching couple’s ink is located on Miley’s inside right ankle, as is Liam’s, and was tattooed on the pop queen sometime in late 2011. And even though the couple’s tats are matchy-matchy, Miley Cyrus’ ankle tattoo isn’t just another heart or a mushy love tattoo. Read on to find out more about the singer’s cool ankle tattoo and what it means! Even though the tat portrays a skull, don’t start worrying that the singer’s tattoo has some kind of morbid meaning. The skull portrayed in Liam and Miley Cyrus’ tattoos seems to be inked in the design of the Mexican “Day of the Dead” skull. The Day of the Dead is a holiday celebrated throughout Mexico and around the world, and provides an opportunity for family and friends to pray for loved ones who have passed away. That’s all well and good, but why the focus on death recently? Miley Cyrus also got a new tattoo inked on her bicep that reads “love never dies,” which seems a little cryptic because the man she loves is still alive and well. 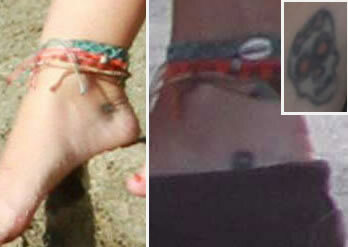 Are you surprised that the identical tats Miley and Liam have are of skulls and not something a little more…romantic? Believe it or not, skull tattoos have become pretty popular these days, especially among attractive female celebrities like Miley Cyrus and Rihanna. Rihanna’s skull tattoo is a cute and girly skull and crossbones inked on the back of her left leg, near her ankle, complete with an adorable pink bow. Even though Miley’s skull tattoo is less feminine, it still has a non-ghostly meaning. It seems that skull tats may be a way for artists like Rihanna and Miley to show that even though they are women, they also have a rebellious side. As if Miley Cyrus’ rapidly growing tattoo collection isn’t evidence enough!